Yield: 40 hl/ha / Age of the vines: 40 years. 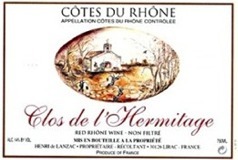 The wine is made of 1/3 each of Grenache, Syrah and Mourvèdre. Vinification: 21 days skin maceration in temperature controlled concrete vats, 9 months oak aging -5% new French oak from Seguin Moreau cooper and 95% of 1 year old barrels.